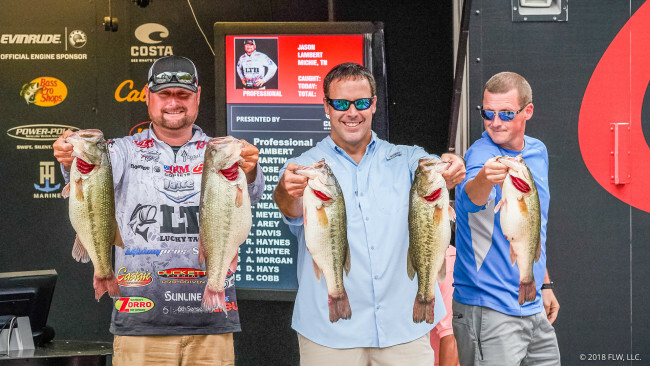 IBASSIN: 2018 FLW Tour Kentucky Lake Day 3: Lambert Controls with 74-06lbs! 2018 FLW Tour Kentucky Lake Day 3: Lambert Controls with 74-06lbs! His 30lb limit vaults Lambert 19lbs ahead of field. Most folks assumed the FLW Tour event presented by Costa Sunglasses on Kentucky Lake would feature a final-day, down-to-the-wire duel between the two best ledge fishermen in the country, Randy Haynes and Jason Lambert. The two Tennessee Valley hammers were far in front of the rest of the top 30 coming into today’s third day of competition. However, an unusual situation played out on Kentucky Lake this morning that, if you watched the FLW Live broadcast or followed the FLW coverage blog, you’re already aware of. Shortly after takeoff, Lambert and Haynes both arrived on the same spot – a well-known community hole at the north end of the lake. It’s a spot that both anglers fished on days one and two. Lambert arrived first, and the two anglers ended up fishing side-by-side for several minutes. Lambert caught several keepers quickly. Frustrated by the situation, Haynes chose to give Lambert the spot and return to the ramp and finish his day early. Haynes officially finished with zero keepers today. It was previously reported that Haynes had committed a rule infraction by failing to compete on a day in which he was qualified to fish. However, the tournament directors later clarified that, because Haynes did compete, there was no infraction. He voluntarily finished early. Again, if you watched FLW Live or followed the blog, you know what happened next. Jason Lambert put an absolute beatdown on Kentucky Lake. By lunchtime, it was clear he had a mega-bag. By weigh-in time, it was clear he would be miles ahead of everyone else by the time the day was done. The only uncertainties were how big Lambert’s limit was, and exactly how far he’d be ahead of second place. We got our answer back at Kentucky Dam State Park this afternoon, when Lambert weighed in a 30-pound, 8-ounce limit of bass, which was anchored by a 9-pound, 2-ounce giant. His three-day total stands at 74 pounds, 6 ounces. Scott Martin, now in second place, has 55-3. He’s 19 pounds, 3 ounces behind Lambert with one day left to fish. The result is a subtle, wobbling jighead that runs true, but with a little hunting action – just enough, but not too much – as he slow-rolls it along the bottom. He’s fishing the combo on 18-pound-test Sunline Super FC Sniper Fluorocarbon. Lambert spent the rest of the afternoon looking. He found one more school that might help him tomorrow. Amazingly, he’s still a little stumped at the current situation on Kentucky Lake. He’s finding schools offshore, but not as many, and with fewer fish than what he’s used to seeing this time of year in previous seasons. Yet it’s obvious that more and more of the lake’s biggest bass are making their way to the ledges every day. The 9-2 kicker is proof of that.